By Xah Lee. Date: 2017-09-28 . Last updated: 2017-11-12 . It's a basic gaming mouse. I must say, am VERY impressed. First, here's the feature list from the company. 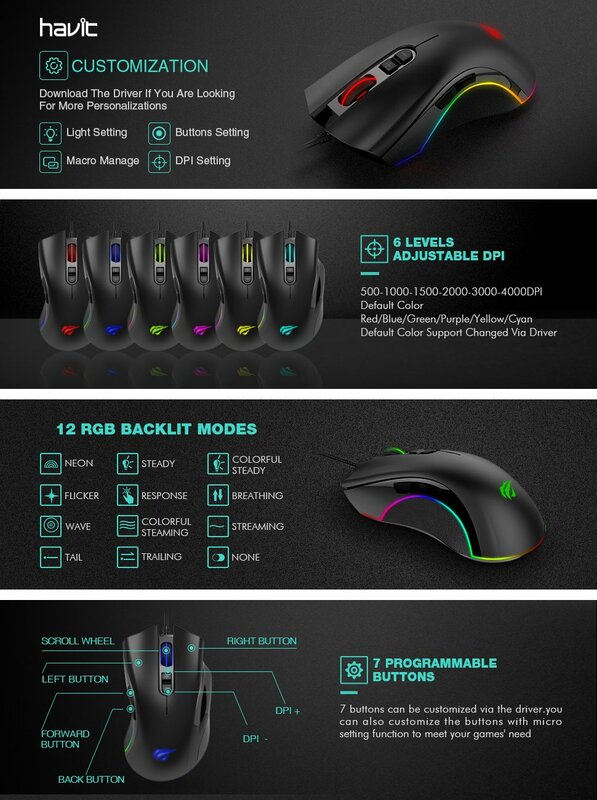 【12 RGB Multi-color Backlit Modes】By default it comes with 12 lighting modes for the LED lights around the mouse edge. (the light for scroll wheel and logo is controlled separately) Press “Forward Button + Scroll Wheel” to change. 【UP to 4000 Adjustable DPI】500/1000/1500/2000/3000/4000DPI. Pres the + and - buttons on top of the mouse to change. The color of logo and wheel changes depending on which DPI is currently on. The color are Red/Blue/Green/Purple/Yellow/Cyan. The mouse is heavy. 168 grams. About same weight as those wireless gaming mouse with battery. I actually prefer mouse as light weight as possible. Yet, for some reason, i like this one. By default, all LED flashes like rainbow the moment you plug it in. I don't care for such gamer's treat, but there you have it. By default, it is not possible to turn them off without installing the driver software. But one of the mode, by pressing the forward thumb button plus press the wheel, switches it to dim red for the mouse edge light. This is acceptable to me. The mouse wheel and logo is breathing, by default. I wish i can make it steady, but don't want bother to download driver software to do so. 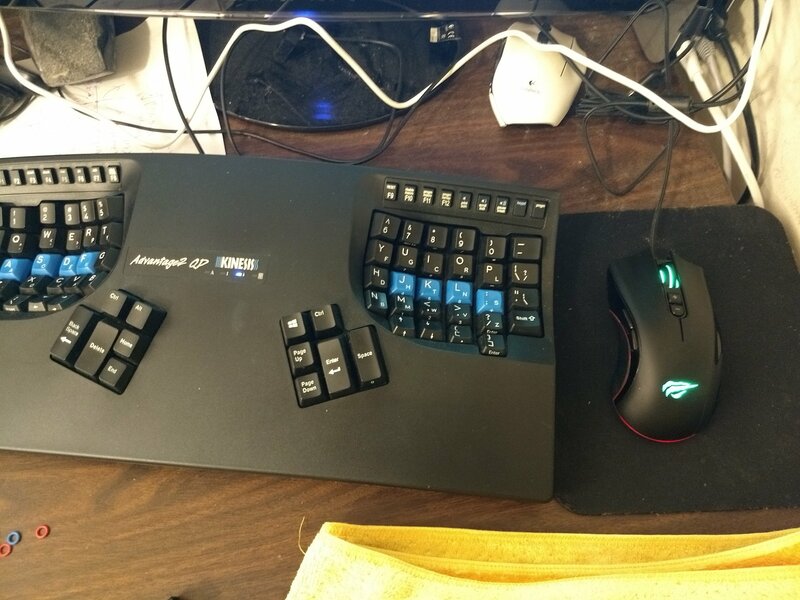 The mouse wheel, is excellet! Of ALL mouses i've used since i ever paid attention in the past 10 years, this mouse wheel, and its middle click, is BEST. It's extremely comfortable to turn. It is a notched wheel, but extremely slight. The wheel surface is somehow a very comfortable rubber material. The middle click, is truly a joy to press. The buttons are well done. Also, i like how the thumb button feels. 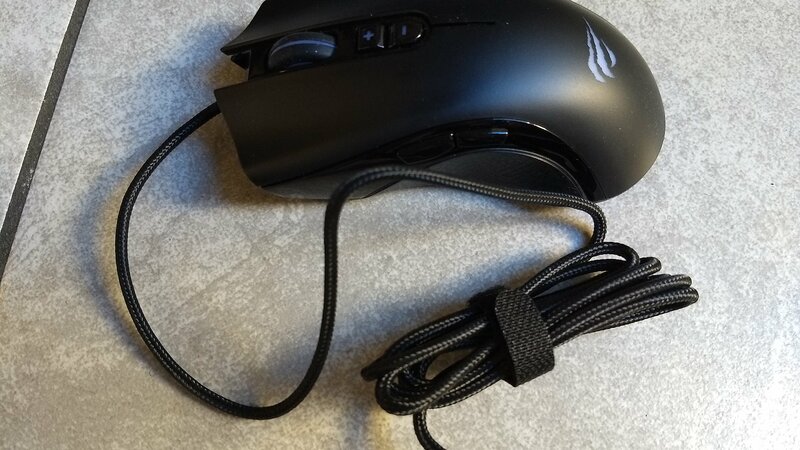 • CM Storm Recon Mouse, has buttons that if you click, it may not register, even though it “clicked”. • the Logitech Trackman Marble Mouse, the button also sometimes click but not register. It comes with braided cables. Cable length is 1.8 meters. About arm to arm span. I did not expect much from this mouse. But, I am impressed by it very much. Now i use this mouse as my main mouse.